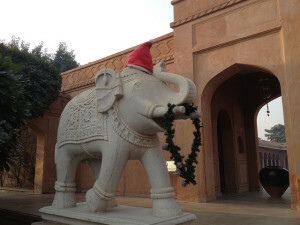 Christmas traditions in India are a reflection of its history of being a British colony and the ethnic diversity of the country. Unlike the United States, where we all observe the same the Federal holidays and expect the banks and businesses to be closed on those days, each state in India determines its own holidays, there are currently 29 states, and rarely do they match. There are just 3 national holidays. Christmas is one of the few holidays observed by all states in India, even though it is not a national holiday. This is also fascinating given that only 3% of the population of India identified themselves as Christian in their last census. It is no surprise to learn that Christmas came to India with the colonization of the country by the British East India Company. While Christian missionaries were in the country centuries before it became home to British tea plantations, it was the observance of the holiday through the closing down of the plantations, railroads, and a break for the British military that the holiday really became part of the culture of the country. Adapting to what the country had to offer, banana and mango trees take the place of fir trees. They are decorated in much of the same fashion as the Christmas trees here in the states or in Europe. There are a lot of decorations on the outside of businesses and home that include an array of lights, lanterns, oil lamps, and nativity scenes. Santa also makes an appearance and the stories about him are very similar to those here in the US. No matter the country, holidays call for big meals with family and friends, and India is no different. Preparations begin weeks in advance with cookies and sweets being made. These are not only consumed at home, but given away to friends and family. The cuisine at these dinners are reflection of the local culture. There is a wide array of spicy soups, vegetable and rice dishes, as well as our favorite beverage, tea. One cannot escape chai tea when in India and it doesn’t disappear for the holidays. The spice blend is unique to each family and reflects their heritage and traditions. The tea is usually boiling on the stove all day, so it is available to guests whenever they want a cup. The human need of gathering friends and family for celebrations over large meals exists in all cultures. 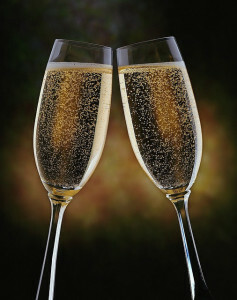 So here is toast to all our similarities and to a happy holiday season. Maharashtrain bhakarwadi is a sweet and spicy fried treat that originates from western Indian state of Gujarati. It is fun to make and a nice departure from your traditional British accompaniments to tea. I have made these by baking instead of the traditional frying. If you wish to fry, you will want a lighter oil like canola or corn oil for the frying and will keep each piece in the oil until golden brown (about 5-7 minutes). Set oven to 350 degrees Fahrenheit. Start by mixing together the ingredients for the dough. The dough will be dry and require additional water as you knead. The goal is to get the dough to stick together but not be too wet. When the dough is slightly shiny and no longer cracks as you knead but is not wet, you have found the right consistency. Cover the dough and move on to making the filing. Maharashtrain Bhakarwadi dough and spicing. This is a dry filing. You will mix together all the ingredients, including the lemon juice from a quarter of the lemon, and then take a little taste. If you would like a little more spice, add in 1/4 teaspoon of ground clove. Cut the dough ball in half. 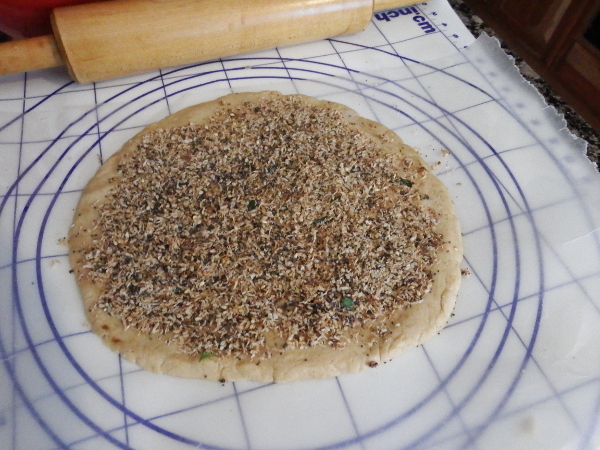 Roll out half the dough to roughly 7 inch diameter circle. I roll on a sheet of wax paper to make it easier to roll the final cookie using the wax paper to support the dough. Once the dough is rolled out. Sprinkle on lemon juice from the other quarter of the lemon you are wondering what to do with. If you already put it in your water, you can also used tamarind paste, just smooth on a thin layer. Pat down, press it into the dough, half the filling. Get it as close to the edge as possible. Then roll the dough into a long flute. Cut it into 1 inch pieces. 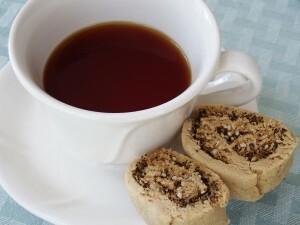 Repeat this process with the second ball of dough and the other half of the filling. Place each piece on a cookie sheet. You can brush the tops and outside with a little oil if you would like a darker color to the dough. They should bake in the oven for 30-40 minutes. At the 20 minute mark, pull them out and flip them over. Watch carefully after the 30 minute mark as you do not want the coconut or sesame seeds to burn. Once you start to smell the spices after the 30 minute mark, pull them out and get them on a plate. You can serve immediately or put in an air tight container. They are good for about a week. 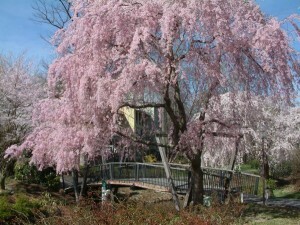 Its Spring in the mid-Atlantic but also in prime picking regions around the world. Spring has sprung in the mid-Atlantic and in addition to flowers in our area this past week saw the first of what will be several first pluckings (first flushes) of the 2016 season. Whether in China, Japan or India, the first flush tea is always considered the most special and typically sells for more money at the tea auctions. First Flush – Why is it so special? As we have talked about in the past, terroir effects the tea plant, and the first flush arrives after the plant has been dormant for some time, usually over winter, or during the peak time of year for the plant’s growth leading up to flowering. Of course it is not to the farmer’s benefit to allow the tea plant to blossom as all the growing energy will go into the flower and not into the leaves. Due to that energy, these first pluckings have the most nuanced flavors and usually demand the highest prices, like Pre-Qing Ming Dragonwell or Bai Hao Silver Needle. Both teas carry a taste of light spring grass or flowers. In China, the first flush comes during the period before Qing-Ming, a big national holiday that is dedicated to the cleaning of the family tomb, to show respect for past relatives and the importance of family, as well as other spring activities like flying a kite. This holiday also falls right around the start of the spring rains. While the rains bring much needed water for the tea plant, they will cause the leaves to loose flavor. 1st Flush Darjeeling from Goomtee Estate in India. In Darjeeling, India, the first pluck will come in late March to early April. A first flush Darjeeling, is practically a green tea with a very light and floral smell, even though it is manufactured as a black. It is truly a reflection of the freshness of spring. While most people are familiar with Second Flush Darjeelings, as that is the Darjeeling that has traveled the globe and has introduced the world to the champagne of teas, it is very different from a First Flush Darjeeling and typically picked in June before the summer monsoons. The first flush in Japan comes in late April to early May. These first flushes go into Ceremonial Grade Matcha, Shincha (not be confused with Sencha), and very top grade Gyokuro. These teas are again lighter and more nuanced flavor adding a sweetness that is not typically found in Japanese greens. Enjoy a first flush tea next time you get a chance and enjoy a cup of spring. The history of tea is intertwined with religion, commerce, early notions of wellness and more. Understanding where tea has come from requires looking at the notable people who influenced the production and consumption this fine drink across the globe. Given that tea has been around for a few thousand years, there are many people to consider, from religious scholars, to corporate spies, and even accidental inventors. There are really too many, in fact, for one blog post so we’ve selected a few of our favorites to touch on briefly. As the man credited with documenting the production and consumption of tea in China, his work, The Classic of Tea, still has meaningful insights into ancient production of tea. 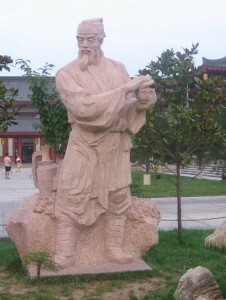 Born in Hubei, in central China, Lu Yu lived between 733 and 804 C.E. This book gives a view into the Chinese practices around tea and its status as one of the seven necessities in life. The poems and quotes in the book are still relevant today, about 1200 years later! This buddist monk, also known as Eisai Zenji (or Zen Master Eisai) is credited with bringing tea seeds to Japan and planting them near Kyoto, creating the first tea farm in Japan. He is also credited with writing the first book about tea consumption in Japan during his lifetime from 1141 to 1215 C.E. His writings on tea are credited with spreading tea culture throughout Japan and setting the stage for the Japanese tea ceremony. Robert Fortune – An early example of corporate espionage. As the botanist for the British East India Company, he is credited with stealing seeds and tea plants from China that where then taken to India to plant. While these initially failed, Fortune (1812 – 1880 C.E.) helped to identify the native camilia seninsis var. assamica, which is considered the backbone of Indian tea. He helped the British East India Company break the monopoly that China had on tea. Living from 1805 to 1874, Arthur Campbell planted camilia seninsis var. seninsis seeds in the Darjeeling region of India. Without him, the British East India Company would not have expanded tea production into Darjeeling and we would be missing a seriously good tea (see Darjeeling – The Champagne of Tea). The story goes that in the early 1900’s Thomas Sullivan started sending tea samples to customers in small bags. Not knowing that this was simply meant as a convenient way to ship the tea, his customers dropped the entire bag in water, soon after complaining that the silk was too fine all the while demanding more tea bags from Mr. Sullivan. He was not the first to create it, but just make it a commercially viable design that was widely adopted. The first to patent the tea bag in the U.S where Roberta C. Watson and Mary Molaren. They were unable to turn their patent into a commercial business, but their design looks pretty similar to the modern day version minus the string to pull it out of the water. There are so many people that have contributed to the history of tea through thousands of years and this is just a small sampling. Do you have a favorite? New Year’s is associated with Champagne, but for tea drinkers this also means its time for Darjeeling, the champagne of tea. (Photo by flicker user Bill Masson – https://www.flickr.com/photos/maxblogbits/ ). 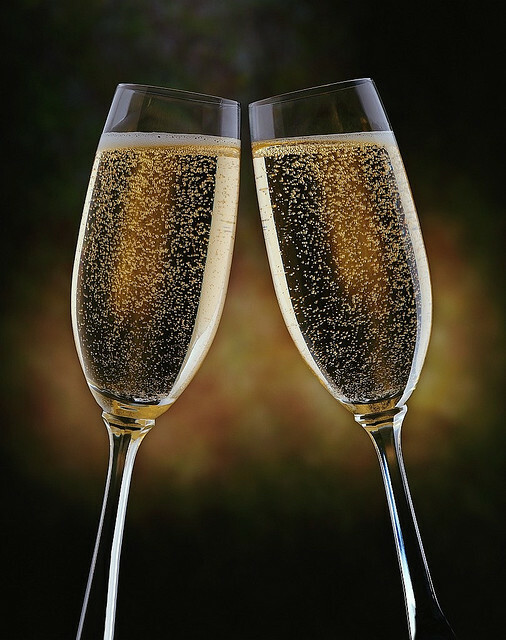 A New Year is traditionally toasted with champagne, for tea drinkers that means bringing out Darjeeling, the champagne of teas. Darjeeling tea got this nickname because of the complex fruit and floral aromas this tea is known for and the limit quantities that are available due to the shorter growing season and high demand. A traditional Darjeeling tea is a black tea, however, the tea leaves are also used to make white and oolong Darjeelings, which are rare outside of West Bengal. The Darjeeling region borders Nepal in the state of West Bengal, India. It is the foothills of the Himalayan Mountains and carries of perfect terroir of high altitude, moderate to cool climate, and rain. 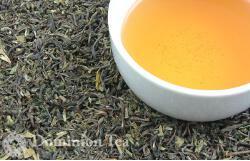 Darjeeling tea is from Camellia Sinensis var. Sinensis, not from Cameliia Sinensis Assamica, which is thought of as the traditional Indian tea cultivar. The high altitudes are what allow the Chinese varietal to thrive in India. On top of being in a distinct region, the Tea Board of India requires registration and monitoring of tea estates in Darjeeling in order to enforce the Geographic Protection given to the region in 2011. Knowing the name of the estate that grew and manufactured the Darjeeling is critical in knowing that the Darjeeling you are drinking is authentic. 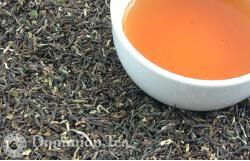 It is estimated that there are 30,000 more pounds of Darjeeling on the market annually than is produced in the region. This has dropped dramatically, but counterfeit Darjeeling has not been fully eliminated. Darjeeling tea is picked in March to April during the first picking, or first flush. This occurs during the spring rains. The second flush is typically picked in June. There can be a picking during the monsoons from late June through the fall, but generally these are less flavorful teas and are often only sold locally and are blended into masala chai in the West Bengal region. A fall plucking of tea can also occur, but again not quite as flavorful as the 1st and 2nd flush. First flush Darjeelings are typically lighter, more floral but will carry a lighter version of the stone fruit flavor than is expected of a second flush. The leaves may appear lighter as these are the first picking and are often not allowed to oxidize as far as a second flush tea. Second flush Darjeelings are what gave this tea its comparison to champagne. This is a complex tea from a flavor standpoint with a mix of stone fruits from apricot and peach to plum. Some people use the term muscatel, which is a reference to muscatel grapes. This is best described as sweet, fruity, and possibly caramel like in flavor. The beautiful complex flavor of Darjeeling tea is worth getting to know in the New Year and makes a perfect tea to start the new year with.